London is the diverse and dynamic capital of the United Kingdom and is tightly packed with lots of exciting experiences. 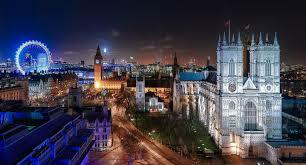 London is a leader ion many areas, such as culture, arts, entertainment, tourism and research and development. Walking is a popular activity in London and there are lots of areas dedicated to it, for example: Wimbledon Common, Epping Forest, Hampton Court Park, Hampstead Heath, the eight Royal Parks and canals. Annually, the London Marathon takes place (April) and the London Triathlon, the longest in the world (August). London has a variety of landmarks. If you like museums, greatwe recommendations are the British Museum, the National History Museum, the Tate Modern and the National Gallery. Architectural features worthy of a visit are St. Paul’s Cathedral, Shakespeare’s Globe, the Tower of London and Westminster Abbey. The last two are UNESCO World Heritage Sites, next to Maritime Greenwich and the Royal Botanic Gardens, Kew. Want to experience London’s night life? Visit one of the many pubs this city has. London has a great transport network, which makes it easy to get around. The easiest way is by London Underground. Buses can be a nice way to see the city, but can be a slow form of transportation. Taxis are of great quality, but expensive negative opinion, suggest to rephrase. Trains are more useful for destinations farther away and traveling by car is not advisable: a lot has been done to discourage travelling by car. Cycling is a good way to get around the city, though traffic can be busy. It’s possible to renthire bikes throughout London fromvia Santander Cycles. You pick up a bike from a docking station and drop it off at another when you’re done. Access fee is free for the first 30 minutes, £2 (€2) for the first 24 hours and after this you pay an additional £2 for every 30 minutes. Otherwise you can find a rentinghiring company.